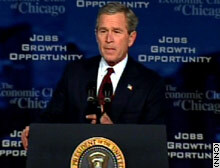 Bush delivers speech Tuesday to Economic Club of Chicago.  CNN/Money: How much will you save?  Graphic: Dividend Tax Cut: Who Will It Help? Thank you all very much. It's a windy day out there, which is a good day for a windy speaker. I'm honored to be your guest here at the Economic Club of Chicago. I want to thank Michael for the invitation. I like a short introduction. He didn't let me down. For 75 years, the business leaders and the entrepreneurs in the club have helped make Chicago a prosperous and energetic city. You understand the concerns facing American workers and employers, and you believe, as I do, that we must address those concerns honestly and aggressively. Today in Washington a new Congress convenes, and I will ask members of both parties to work with me to secure our economic future. We cannot be satisfied until every part of our economy is healthy and vigorous. We will not rest until every business has a chance to grow and every person who wants to find work can find a job. So today I'm announcing a growth and jobs plan to strengthen America's economy, specific proposals to increase the momentum of our economic recovery. And this is a good city to give it in. This is one of America's great cities. And one of the reasons why is because you have a great mayor in Richard Daley. We're from different political parties, but we have some things in common. We both married above ourselves. It is good to see the first lady of Chicago here. We both have famous and influential brothers. Our dads spent a little time in politics. And we love our country more than we love our political parties. The thing I like most about the mayor is he gets the job done for the people of Chicago. And, Mr. Mayor, I'm proud to call you friend. And I want to thank another proud son of Chicago, Rod Blagojevich, for being with us today as well. He's soon to have the second best job in America -- being a governor. I congratulate him on his election. I look forward to working with him for the good of Illinois and for the good of our country. Thank you for coming, Governor-elect. I appreciate your being here. I flew in today with the senator from Illinois, Peter Fitzgerald. I appreciate his leadership, I appreciate his friendship, and as we speak, the Senate is debating the Fitzgerald bill which will extend unemployment benefits to those who are looking for work in America. And Peter, I want to thank you for your leadership on this important issue. And on that very same airplane was traveling with me Steve Friedman, who's the new director of the National Economic Council. I'm honored that such a respected economic leader has agreed to join my administration. I appreciate the fact that he's willing to take time away from a comfortable private life to serve our country. He is a strong addition to a great economic team and I want to thank him for his willingness to serve America. Thank you for coming, Steve. I've also named two other good people to join this team. John Snow is my nominee to serve as the secretary of treasury. So we acted. We reopened the markets. We helped the people of New York City recover. We assisted the airlines. We provided tax incentives for business investment. And we passed terrorism insurance so building and real estate projects could go forward. And then our economy was tested a third time, when Americans discovered serious abuses of trust by some corporate leaders. So we passed historic reforms to assure corporate integrity, to punish wrong-doers and defend the interest of workers and investors. Corporate greed and malfeasance cause innocent people to lose their jobs, their savings, and often their confidence in the American system. For the sake of justice and for the sake of every honest business in America, I have made this commitment. Corporate misdeeds will be investigated. They will be prosecuted. And they will be punished. We have met the test before us because the American people have worked hard through difficult times. And now our country has entered its second year of economic growth. Our trade with other nations is expanding, bringing lower prices that come from imports and better jobs that come from exports. More Americans are buying and building houses, a central part of the American Dream. The home ownership rate is now 68 percent, close to the highest ever. Low interest rates have allowed Americans to tap the rising value of their homes. In 2002, refinancings added more than $100 billion to American pocketbooks, money that helped renovate homes or pay off debt or cover tuition or purchase other goods. The most important indicator of our economic strength is the growing skill and efficiency of the American worker. The productivity of American workers went up by 5.6 percent over the last four quarters for which we have data -- the best increase since 1973. As productivity rises, so do wages, and our standard of living. Nationwide incomes are rising faster than inflation. We have the most productive, creative and promising economic system the world has ever seen. America sets the standard for scientific research, engineering skill, and medical innovation. Our companies and universities attract talent from every single continent. Investors from around the world know America is the safest place to put their money. People around the world who search for a better life still dream of working and living in the United States of America. All these conditions create a platform for long-term growth and prosperity. Yet in spite of successes, we have more work to do because too many of our citizens who want to work cannot find a job, and many employers lack the confidence to invest and create new jobs. We can help assure greater success tomorrow with the policies we choose today. Now, these policies must recognize that our $10 trillion economy is sustained by the labor and enterprise of the American people. Government spends a lot of money, but it doesn't build factories. It doesn't invest in companies or do the work that makes the economy go. The role of government is not to manage or control the economy from Washington, D.C., but to remove obstacles standing in the way for faster economic growth. That's our role. And those obstacles are clear. And those obstacles are clear. Many jobs are lost in America because government imposes unreasonable regulations, and many jobs are lost because the lawsuit culture of this country imposes unreasonable cost. I will continue to press for legal and regulatory reform. But today I want to talk about these concerns: Americans carry a heavy burden of taxes and debt that could slow consumer spending. I'm troubled by that. I'm also troubled by the fact that our tax system unfairly penalizes some productive investments. And I worry about people who are out of work. They need our help, both in short-term benefits and long-term opportunity. By directly confronting each of these challenges, we can preserve the hard-won gains our economy has made and advance toward greater prosperity. Our first challenge is to allow Americans to keep more of their money so they can spend and save and invest -- the millions of individual decisions that support the market, that support business and help create jobs. Consumer spending accounts for about 70 percent of our economy. It has been the driving force of our recovery. Yet there are warning signs I won't ignore, and I hope the Congress doesn't ignore either. Many Americans live in constant and increasing personal debt, with credit card bills so heavy they often cannot pay much more than the monthly minimum. Millions of citizens spend their entire adult lives living paycheck to paycheck, never getting a chance to save for their children's education or their own retirement. Americans today are paying about a third of their income in taxes. All of this puts pressure on family budget, and, therefore, clouds our economic future. Americans facing these struggles are due to receive additional tax relief in 2004 and again in 2006. Republicans and Democrats in Congress already approved these tax rate reductions, and the time to deliver the tax rate reductions is now when they can do the most good for the American businesses. For the sake of economic vitality, I'm asking Congress to make all the tax rate reductions effective this year. And the tax cuts should be retroactive to January 1. Upon passage, I will order the Treasury Department to immediately adjust the amount of money withheld for income taxes so that Americans will keep more of their paychecks right away. By speeding up the income-tax cuts, we will speed up economy recovery and the pace of job creation. If tax relief is good enough for Americans three years from now, it is good enough for Americans today. An additional beneficiary of this tax cut will be small businesses. About 30 million Americans include small-business income when they file their individual tax returns with the IRS. Faster tax relief will help these businesses to expand sooner, to hire new people faster and to build a stronger foundation for the recovery. We also know that middle-income families need additional relief. So today, I'm asking Congress to speed up three other tax reductions promised in 2001, tax reductions that will help our middle-income families. Instead of slowly reducing the marriage penalty until 2009, we should do it now to help 35 million married couples. Instead of waiting until 2008 to move more taxpayers from the 15 percent bracket to the lowest bracket of 10 percent, we should make that change now and help 2 million working Americans. And instead of gradually raising the child tax credit from $600 to $1,000 per child by the year of 2010, for the benefit of 26 million families, we should raise it now. These tax reductions will bring real and immediate benefits to middle-income Americans. Ninety-two million Americans will keep an average of $1,083 more of their own money. A family of four with two earners and $39,000 in income will receive more than $1,100 in tax relief. Real money to help pay the bills and push the economy forward. And the sooner Congress acts, the sooner the help will come. Taken together these income tax cuts will put an additional $70 billion to work in the private economy over the next 18 months. And there's no better way to help our economy grow than to leave more money in the hands of the men and women who earned it. Our second challenge is to encourage greater investment by individuals and small businesses, the kind of investing that builds personal wealth and helps companies expand creates new jobs. We are increasingly a nation of owners who invest for retirement and the other financial challenges of life. One half of American households own stock either directly or through pension funds. And we have an obligation to make sure, now more than ever, that American investors are treated fairly. We can begin by treating investors fairly and equally in our tax laws. As it is now, many investments are taxed not once, but twice. First, the IRS taxes the company who owns the profit, then it taxes the investors who received the profits as dividends. The result of this double taxation is that for all the profit a company earns, shareholders who receive dividends keep as little as 40 cents on the dollar. Double taxation is bad for our economy. Double taxation is wrong. Double taxation falls especially hard on retired people. About half of all dividend income goes to America's seniors. And they often rely on those checks for a steady source of income in their retirement. It's fair to tax the company's profits. It's not fair to double-tax, by taxing the shareholder on the same profits. So today, for the good of our senior citizens and to support capital formation across the land, I am asking the United States Congress to abolish the double taxation of dividends. The benefits of this tax relief will be felt throughout the economy. Abolishing double taxation of dividends will leave nearly 35 million Americans with more of their own money to spend and invest, which will promote savings and return as much as $20 billion this year to the private economy. By ending this investment penalty, we will strengthen investor confidence. See, by ending double taxation of dividends we will increase the return on investing which will draw more money into the markets to provide capital to build factories, to buy equipment, hire more people. We must also encourage the investments that help turn small businesses into larger ones. Small businesses create the majority of new jobs in America and they account for half the output of the economy. Currently, tax law permits small firms to write off as expenses up to $25,000 worth of equipment; buy computers or machinery that they need. I'm asking the Congress to raise that limit to $75,000 and index that number for inflation. This change, together with the faster rate reductions, will benefit more than 23 million small business owners. My view is this economy can thrive only if our small businesses thrive, and we will provide them every incentive to grow and create more jobs. A third challenge facing our country is the need to help unemployed workers and prepare them for the new jobs of a growing economy. The unemployment rate today is 6 percent. It's low for an economy coming out of a recession. It's higher than it should be. And the unemployment rate is projected to rise even further in the short run. This hardship is concentrated in certain regions and in certain industries. Manufacturing jobs have declined for 28 months in a row. You know what I'm talking about here in the Midwest. You're showing signs of recovery here, yet many people here and across this country are still looking for work. A woman in Arkansas tells a typical story. She talked about the fact that her husband was laid off from his job at a local steel mill. Both she and the husband have been looking for a job for quite a while. Here's what she said: "There's just nothing for me to find. We're trying to save up what little money we have and move to another community and look for jobs there." Got to be worried about those kind of stories here in America. As we encourage long-term growth, we will not forget the men and women who are struggling today. Close to 70,000 workers each week exhaust their unemployment benefits, and we have an obligation to help our fellow citizens. So I'm asking this new Congress to extend unemployment benefits that expired on December the 28th. And the benefits Congress approves should be retroactive, like the Fitzgerald bill, so that people who lost their benefits last month can receive their benefits in full. Helping America's unemployed workers should be a first order of business in this new Congress, and it looks like it's going to be. We must be more creative when we help those who have the hardest time finding work. To encourage innovation and more choices and to help those who are out of work find the dignity of a new job, today I'm unveiling a new approach to helping unemployed Americans through personal re-employment accounts. Under this new program, Americans who face the greatest difficulties in finding work will receive up to $3,000 to use in their job search. They will have great flexibility in how they use that money. A person with a re-employment account will be able to decide whether to use the funds for job training or child care or transportation or even to cover the cost of relocating to another city for a new job. If a job is attained quickly, within 13 weeks, the worker will be able to keep the cash balance as a re-employment bonus. As we see new economic growth we will need well-trained workers to fill new jobs, so I'm going to ask the Congress to provide $3.6 billion to the states to pay for the re-employment accounts, enough money to help more than a million unemployed men and women across America. In order to strengthen this economy in the future we must help these Americans today. The jobs and growth proposals I've outlined today are a focused plan to encourage consumer spending, to promote small business growth, to boost confidence in our markets and to give critical help to unemployed citizens. Overall, this growth package will reduce the tax burden of Americans by $98 billion this year and $670 billion over the next decade. I proposed a bold plan because the need for this plan is urgent. And I urge the Congress to act swiftly and pass this bill. Our nation has seen two years of serious and steady challenges. The recession and the decline in the stock market slowed earnings and cut into tax revenues and created a budget deficit. And in this time of war, I can assure you, this government is spending what is necessary to win the war. But the Congress must also understand this: The American people deserve and expect spending discipline in Washington, D.C.
With spending discipline and with pro-growth policies, we will expand the economy and help bring down this deficit. This growth and jobs package is essential in the short run. It's an immediate boost to the economy. And these proposals will help stimulate investment and put more people back to work, is what we want to have happen. They're essential for the long run as well to lay the groundwork for future growth and future prosperity. That growth will bring the added benefit of higher revenues for the government, revenues that will keep tax rates low while fulfilling key obligations and protecting programs such as Medicare and Social Security. We're meeting the challenges to America. We're strengthening our economy. And we're taking the battle to our enemies. And we're not going to leave our work half finished. In the months ahead we'll confront every threat to the safety and security of the American people. We'll press on to turn our recovery into lasting growth and opportunity that reaches every corner of America. By the courage and by the enterprise of the American people, this great nation will prosper, and there's no doubt in my mind this great nation will prevail.